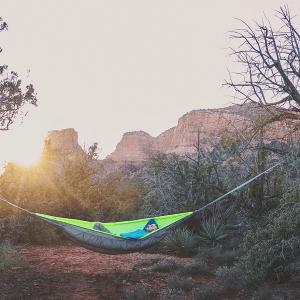 The Classic Hammock takes the traditional gathered end hammock and adds a few essential features for the Superior Hammock experience. Like our flagship insulated Superior Hammock, the Classic has a built-in Adjustable Ridgeline to set your perfect consistent hang angle. And it comes with the Superior Snap system which allows mating to our Universal Comforter (convertible top quilt and bottom quilt), as well as the Superior Blanket and other accessories. 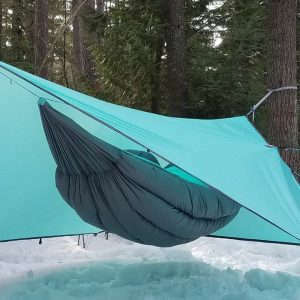 The Classic can be the perfect base for the ultimate modular hammock system. 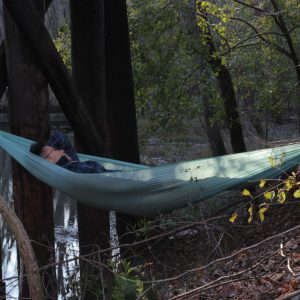 Or it can just be a fantastic stand-alone hammock for the casual backyard hammocker. The end loops are made of specialized polyethylene, which is stronger than steel, but light enough to float on water. The Classic is made of cutting-edge, super strong Nylon and can support up to 300lbs. It is 10 feet long, weighs 11 ounces and comes with a quality stuff sack.